Made of compressed foam, this Noah's Ark book has a padded front cover and contains a removable die-cut piece on each two page spread. 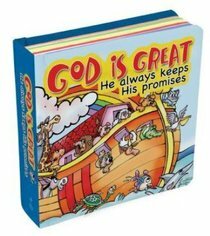 It will enhance little ones that God always keeps His promises. Ages 3 and up. About "God is Great (Lift And Look Board Books)"